What follows is a report based on the proceedings of the Student Leadership and Employment Forum that took place on Saturday April 6, in Montreal. This event was organized with the support of our Quebec member group, Association québécoise des étudiants ayant des incapacités au postsecondaire (the Quebec Association of Post-Secondary Disabled Students), AQEIPS. We'd like to thank Serge Brassard, Executive Director of AQEIPS, for his assistance in promoting the forum to students in the province and for helping us to identify speakers for the student leadership and employment panels. Susan Vida, NEADS' Quebec Representation, did an excellent job Chairing the forum and keeping the discussions on track. Steve Estey, NEADS' Student Leadership and Employment Forums consultant, welcomed participants and explained the objectives of the project and the meeting. He also offered closing remarks. The event was divided into two distinct focus areas: student leadership and employment. Discussion in each area was similarly structured, with a panel presentation to introduce each subject and put it into context, and then small group discussions that took place around a prepared set of questions. Both subject sessions were chaired by Susan Vida. At the end of each discussion, groups reported their findings back to the larger forum. This report follows that same structure. Over the course of the day, about 40 participants joined the discussion. Most of the forum participants were youth with disabilities in university, college or Cégep programs. Student and service provider participants included representatives from: Cégep du Vieux Montréal, University of Laval, University of Montreal, Dawson College, and Concordia. Simultaneous interpretation was provided throughout the day. Gerard began the day's first panel by discussing his involvement with AQEIPS, as well as the work of the Association as a whole. Gerard said he began working with AQEIPS shortly after starting at CEGEP, and has been a member of the Association ever since. AQEIPS' mission is to ensure students with disabilities in Quebec have access to post-secondary opportunities, and to foster integration for people with disabilities into the educational community. 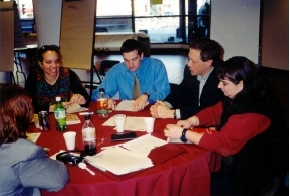 The group seeks to achieve these goals through activities such as: lobbying for the rights of students with disabilities; helping to educate the public on issues affecting people with disabilities, using the media and other forms of information dissemination; and by helping students with disabilities find employment opportunities. Gerard also told forum participants about the bursaries AQEIPS awards each year to deserving students with disabilities at different levels of post-secondary education. He says the purpose of the AQEIPS scholarships is "to enable people with a disability to pursue their studies and to encourage them to defend their rights, to be socially active and to deal with the extra costs incurred due to their disabilities." The scholarships are awarded in five categories: pre-university; CEGEP; technical college; undergraduate university; Master's and PhD. The second speaker, Louis Chabot, along with Erick Bouchard another member of the board of the organization, spoke about the campus group called ADEHUL, Association des étudiantes et étudiants handicaps de l'université Laval. Louis told the forum participants that ADEHUL was formed in 1996, to address the needs of university students with disabilities at Laval University. The group attempts to facilitate the full participation of students with disabilities in university life, and to help these students overcome the obstacles that can sometimes cause them to fail to finish their degrees. The organization provides services designed to allow students with disabilities better access on the university campus, and helps to raise awareness both on-campus and within the larger community, of the issues faced by these students. It also has a seat on a committee that is responsible for deciding how a $25,000 grant for campus accessibility is spent. In addition, Louis said that ADEHUL wants to provide a service that will match up older students with disabilities with those students just beginning their university education, in an effort to ease the transition. In addition to its on-campus efforts, ADEHUL has attempted to build relationships and conduct important activities within the community as a whole. 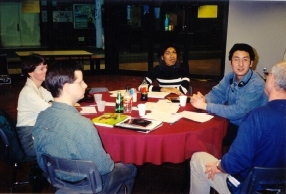 It was noted that the organization's close ties to university departments and other organizations have provided important research and conference-planning initiatives. The group has maintained contact with the individual in charge of services for disabled students at the province's ministry of education, and Louis noted that the relationship has led to improved services in Quebec. ADEHUL also successfully lobbied to have scholarships for students with disabilities reinstated by an organization that had cut them, and for a local credit union to increase its physical accessibility. "It takes disabled students to really understand what kinds of problems exist, and we are in the best position to provide the services (students with disabilities) need," Louis told forum attendees. Louis said the organization has taken a variety of steps to get its message out, and makes itself known to students with disabilities. In addition to a Web site, the organization placed an advertisement in a publication given to some 25,000 new university students. The outreach efforts have resulted in ADEHUL's membership growing from 12 to 43 students over the past year. Chris, who is also the Website Architect for NEADS, spoke about his involvement in disabled students' issues at Dawson College. He holds a seat on the executive council of the Dawson students' union, which has allowed issues affecting students with disabilities to be voiced at the top level of the school's council. This seat was created for a disabled student representative in 1988. In addition to representation on student council, Chris noted that the needs of Dawson students with disabilities are met through a student seat on the college's Department for Students with Disabilities, and through the Dawson Association for Students with Disabilities. Chris said that Dawson students with disabilities have been able to secure better exam accommodations, as well as office space for their work. In addition, they are currently working on restricting traffic to an accessible elevator to those students with disabilities who need it, and are trying to have a "smoker's pit" moved, because it is currently located near an accessible entrance on campus. Another important project currently being worked on is updating the college Web site, and ensuring it is accessible. Chris completed his presentation by speaking briefly about NEADS' new CampusNet project. He has been the lead member of the project team developing and designing the site. The project has involved creating an online community for student leaders with disabilities, so they have a place to meet virtually and share ideas and advice. Through CampusNet, assistance was provided to AQEIPS to launch its Web site and information on and links to groups across Canada are available on the site. CampusNet, which has been developed with funding from the Office of Learning Technologies of Human Resources Development Canada, will include a bulletin board system for discussion of issues according to a list of categories that can be selected. Susan concluded the session on student leadership by speaking about her experience in student leadership an individual advocating for her own right to accessible education and in her role as the Quebec Representative of NEADS. She outlined some of the key projects and activities of the National Educational Association of Disabled Students. Susan began her involvement with NEADS and student leadership in 1996, after attending a conference held by the Association in Toronto. She mentioned that she came to that conference angry at the difficulties she was facing getting accommodations for her disability. Susan has served as NEADS' Quebec representative, and been involved in many of the Association's activities. Susan told the group that NEADS is supported with project and organizational funding by Human Resources Development Canada. NEADS also advises HRDC and its minister on matters affecting its membership on committees and in various consultations. She encouraged those in attendance to look at the many reports and publications published by the Association for students with disabilities, most of which can be found in their entirety at www.neads.ca. Finally, Susan mentioned that elections for NEADS next board of directors will be held at it biannual conference in Ottawa this fall. Accessibility and the availability of interpreters are both issues faced in Quebec by students studying at night. Students with disabilities making the transition from high school to post-secondary institutions are largely unaware of their rights. Students with disabilities need to have contact with school administrators, to ensure money earmarked for disabled students' issues is spent wisely. New campus groups for students with disabilities should ensure they are effectively promoted to students on campus, so that those who require the services of such groups know they exist. NEADS should offer grants or bursaries that campus student groups can access to help achieve their goals. Concordia has had problems forming a group for students with disabilities, because "students are disconnected from each other." At Concordia, students with disabilities are also faced with physical accessibility problems, problems with the effectiveness of buses and the shuttle system, and lack of information for students on the technology available to them and how to use it. Dawson College's association for disabled students has been largely inactive of late, but there are a number of students interested in getting the group more active. Currently, the association's membership is working on awareness-raising activities at the college. Students interested in starting a group for students with disabilities on their campus should consult with established organizations, such as NEADS and local Independent Living Centres. Campuses that don't have enough students with disabilities to form their own student groups should consider turning to groups within the community to help fulfill their needs. Schools should consider the notion that students with disabilities are present on campus when planning extra-curricular activities, and ensure these activities are accessible to as many students as possible. The excuse that money isn't available in a school's budget for disabled students' needs is not always believable. Institutions should look at how they can redistribute their funds to address this. NEADS should be able to provide important assistance to students with disabilities at Concordia, once a student group is started there. It is important to sensitize educational staff to the needs of students with disabilities. Students with disabilities should learn advocacy skills, so they can advocate properly for their rights at school. Frank Bouchard, Responsable de la stratégie jeunesse, began the afternoon session by explaining what CAMO is, and what it does for persons with disabilities in Quebec. The acronym CAMO is short for comité d'adaptation de la main-d'œuvre pour personnes handicapées. CAMO is a provincial employment and training program, supported with funding from Human Resources Development Canada and Emploi Québec, that works to identify obstacles faced by people with disabilities in the workplace. CAMO works with other organizations in the province, and conducts research and awareness-raising activities. CAMO implemented a youth strategy based on a study it conducted throughout Quebec, which determined the problems youth with disabilities faced both in school and when entering the workplace. In addition, CAMO has created videos for high school students, and publications for employers that discuss accommodations and accessibility solutions. Frank told the group that while CAMO is not directly involved in helping youth find employment, it can steer people in the right direction to find jobs. The organization has compiled lists of resources students can turn to in order to find summer jobs, and other first-employment opportunities. CAMO also has an Integration Fund, the Quebec version of the federal Opportunities Fund, which is used to provide employers with grants they can use to pay salaries, or to purchase adaptive technologies. He concluded by encouraging youth with disabilities who need assistance finding employment to contact CAMO directly or through its web site: www.camo.qc.ca Information packages on CAMO, its programs and research were available on the side table. Sandra MacInnis, Communications Director, discussed the Career Edge program generally, and then presented information about Ability Edge as an internship initiative for youth with disabilities. She also addressed some of the issues related to supporting employment for people with disabilities that she has seen through her work with the organization. Career Edge, which was started in 1996, is a national youth internship program. It is designed to provide meaningful work experiences with some of the best companies in Canada. The program was launched by employers who were very interested in ensuring that they create opportunities for graduates of university, college and high school. The aim is that when youth come out of school they will have an opportunity to find work in Canada and develop skills to get started in a career. Against this background, Career Edge has developed a program of internships aimed at graduates with disabilities, called Ability Edge. Ability Edge is partially supported with funding from the Youth Initiatives Directorate of Human Resources Development Canada. The program was originally piloted in 1999 with five companies in the financial services sector in the Toronto area: Bank of Montreal, CIBC, Scotiabank, Toronto Dominion and Royal Bank. Since then, a number of other companies have joined the banks. The program is now being run through six pilot cities: Halifax, Toronto, Montreal, Ottawa, Calgary and Vancouver. Sandra stressed that candidates with disabilities are welcome to apply to the general Career Edge program. However, Ability Edge offers extra support and consideration for participants with disabilities. The experience of this program has shown that internship opportunities will appeal to individuals who have the drive and confidence to prove themselves on the job. Sandra told the group that there needs to be an increase in the number of employment training opportunities for students with disabilities, an improvement in the use of "cooperative modes", and the involvement of industry in helping create opportunities for employment. In addition, she said employers have to increase their openness for change, and their appreciation of cultural differences. Ability Edge (Avantage carrière) the section of the Career Edge program designed for students with disabilities. It works with employers, and with organizations such as HRDC, to create paid internships for disabled students. Sandra said the positions offered through Ability Edge pay $1500 per month, and provide interns with the opportunity to build self-esteem, understand their personal skills and abilities, and network with industry members in an effort to create long-lasting career opportunities. The program provides student interns with assistance through a 1-800 number and informative Web site, as well as a publication sent to all participants. Interns must sign a code of conduct agreement before beginning the program. Sandra said 73 percent of the program's interns have gone on to positions with their employer after the internship ended, and many of those who didn't end up working with their internship organizations found similar work within the few months following their internships. Many of the students involved have provided positive feedback on the program. Sandra concluded her presentation by telling students in the audience to consult www.abilityedge.org for more information about internship opportunities. Marie-Pierre Olivier is head of diversity and equity at the Bank of Montreal, for Quebec and the Maritimes. She spoke about some of the bank's programs and initiatives. She said the Bank of Montreal has a diverse staff, and ensures that all employees are treated equally. "It is important that our staff is the image of our clientele," she said. The Bank of Montreal takes part in the Career Edge/Ability Edge program, placing students with disabilities in internship opportunities within the company. She said that the chance to work with interns has been a great advantage for the bank. She said that, since the six-month internships allow interns to become familiar with The Bank of Montreal and its business, and as such it makes sense in most cases to offer student interns positions once the program is over. Marie- Pierre then said the placement rate of Career Edge interns into full-time positions with the bank is over 80 percent. Marie-Pierre said the Bank of Montreal supports the needs of employees with disabilities through its Equity at Work adaptation fund, which can provide things such as interpreters and adaptive workstations. In addition, the bank's lab in Toronto tests systems used to ensure they are compatible with the needs of employees with disabilities. Literature on the Bank of Montreal's programs was available on the side table. René Jolicoeur is a hiring manager with the Equipment Financing sector of GE Capital Canada. He spoke about how the company operates, and what it looks for when hiring new employees. The company is a large, global corporation involved in finance, medical systems, the media, real estate, and a number of other ventures. Each separate sector of the GE parent company works together to share experiences and ideas, to try and improve their operations as a whole. The company also has a "GE University", where employees can learn specialized techniques and training. René said that, when hiring, he considers the skills he might be available to develop in a potential employee that are relevant to the company, rather than looking at only the skills the candidate learned in previous employment. He said GE values honesty, creativity, energy and the ability to get things done, and attempts to assess applicants' potential for these skills. Additionally, the company considers academic achievements and other ways the individual stands out. René said it is important that job candidates do some research on the company before coming for an interview, and demonstrate self-confidence, leadership capabilities, and interpersonal skills. The company recruits on campuses across Canada for new talent, and takes interns from a variety of academic programs, such as engineering, computer science and business. "Canada is a great source of talent," René said. Facilitator Susan Vida concluded the panel presentations by stressing to those in attendance that in addition to internship opportunities, students can gain valuable work-related experience through volunteering and community service activities. These opportunities also look good on resumes. Frank Bouchard responded to a question about whether national companies might be able to avoid provincial equality laws in hiring, by saying that national companies looking to hire in Quebec are usually set up provincially to better search for candidates, and therefore have to abide by provincial rules. Sandra MacInnis told the group that companies interested in providing internships through Ability Edge must ensure they have appropriate adaptive technology in place. The program sends representatives to businesses to help them determine what technology is needed. Sandra responded to a question about whether internships were offered for mature students by saying that although their program funding through Human Resources Development Canada is meant for individuals between ages 16 and 30, they don't have an age limit on interns accepted. Marie-Pierre Olivier added that the Bank of Montreal has accepted Career Edge interns in their forties. Also, she said the bank helps interns learn to use adaptive technologies as part of their training. René Jolicoeur said that GE often has summer jobs available and coop terms, and that both types of positions are recruited through post-secondary institutions. Marie-Pierre said that the Bank of Montreal has a summer coop program called Career Possibilities, in which university students are recruited in their first year and invited back each summer through their degree. Many are then hired once they graduate. Frank mentioned that CAMO has a program designed to specifically help students with visual impairments gain summer employment, and that it has also worked extensively with those with functional limitations to find jobs. Sandra advised students to keep their resumés short - about two pages - and to tailor it to the specific position they are applying for. She also noted that, by law, individuals do not have to disclose a disability when applying for a job. Marie-Pierre added to Sandra's advice, saying that you should ensure you don't leave long periods of employment off your resumé. If you don't list anything for a two-year period, an employer is going to wonder why. René told participants that people with disabilities with GE have generally had the same opportunity as non-disabled employees to be retained and promoted within the company. He added that their director of taxation uses a wheelchair, and "it was never an obstacle to him getting promoted." Disabled students attempting to enter the work world face obstacles such as negative employer attitudes, lack of access to adaptive transportation, and lack of access to resources for workplace adaptation. These barriers can be alleviated by creating employment programs specifically for individuals with disabilities, and by training employers about how best to work with disabled employees. Employees with disabilities should inform employers about their disability, in order to ensure they can gain proper adaptive technologies. The problem with financial support programs companies can access to hire people with disabilities, is that once the grant has expired, after several months or a year, the company may not choose to retain that employee on their own payroll. One participant reported being refused proper accommodations needed for an interview. Applicants with disabilities should try to envision what a job will entail and how they could best do that job, so they can inform the employer of what they might need to perform that job effectively. There was some belief that companies that are federally regulated, and the larger, wealthier corporations are more likely to provide proper adaptive technologies than smaller businesses. Many students said the information and resources they were presented with during the session would be valuable in helping them search for employment. CAMO resources and information should be offered in English, so that Anglophone students can make use of the organization's resources. Another obstacle students with disabilities face when entering the work world is that many take extra time to complete their studies, so when they have finished school they are older than their peers and still have little or no work experience. Students with disabilities should do internships and volunteer to gain experience for employment. Many of the programs designed to help fund employment opportunities for people with disabilities are not really applicable to those with learning disabilities, which limits their possibilities. The increasing number of job postings listed only on the Internet pose a problem for those people with disabilities who can't access the Web. There should be more job fairs geared specifically for people with disabilities. Programs which match employed people with disabilities and students with disabilities looking for work would be helpful. Quebecers have programs through which they can apply for adaptive equipment, so employers don't always have to supply these items. But acquiring upgraded equipment through these programs can pose a problem. Acquiring experience through part-time work can be problematic, as some employers may not want to pay to provide adaptations for such a short time period.